This swinging social features a live DJ, food by Taste of the Wild Catering, cash bar, keeper meet-and-greet, and discovery stations along the Ape Walk. Original artwork by gorillas, orangutans and other primates will be available for purchase. Tickets are $35. Advance purchase is required and ticket sales close at 5 p.m. on Wednesday, September 14. The Young Professionals of Albuquerque co-host the event. Zookeepers have already raised almost $5,000 of their $50,000 goal. The Gorilla Bachelor Pad adds 720 square feet to the existing building. With suspended hoses, tires, platforms and hammocks, the Zoo’s three adolescent males will be able to play and rest in the space. Visitors will be able to see inside through a special viewing window. Keepers will also be able to use the additional space to manage the changing social dynamics of the gorilla troop. 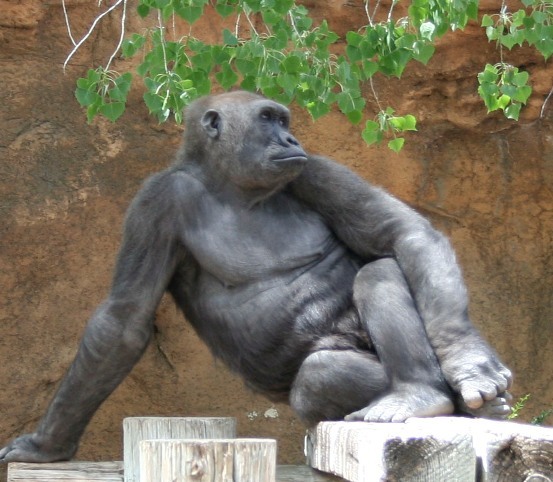 Caption: A western lowland gorilla relaxes at the Zoo. Photo courtesy of ABQ BioPark.